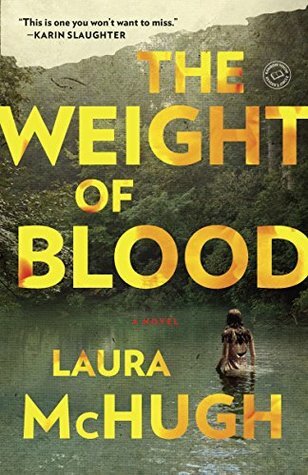 COLUMBIA, Mo 12/12/17 (Reviews) -- If you're looking for Christmas gifts or vacation pleasures, you can't go wrong with two novels by Columbia authors Laura McHugh and Alex George. I bought the books at this year's Unbound Book Fest and read them over the summer. Setting Free the Kites is George's story of three boys -- Robert, Nathan, and Liam -- bound to difficult circumstances and each other in 1970s small town Maine. How they eventually break free and soar is a kite-like journey of humor, tenderness, shock, and surprise George tells with an almost flawless, exacting prose. The Weight of Blood is a double mystery that doubles down on the kind of darkness you can only make out when there's enough light at the end of the tunnel. A heinous murder with no apparent motive sets readers on a perilous journey toward that light, as a young woman in rural Missouri seeks the truth behind her mother's disappearance. Both stories struck me with their empathy, especially George's treatment of Liam Carter, a young man with Duchenne muscular dystrophy, a debilitating neuromuscular disorder. Like my sister Stephanie, who died at age 28 from the same disease, Liam approaches his physical suffering -- which George describes accurately and compassionately -- with the most amazing optimism. Though they both faced certain death at young ages, Stephanie and Liam did more planning for a bright future than anyone else I've ever known. McHugh gives us the wonderful Lucy Dane, whose kind, accepting nature disguises the intelligence, insight, and observational prowess she must rely upon to end a long and terrible crime. McHugh particularly shines in her portrayal of the people Lucy loves and loathes in Henbane, Missouri, a tiny Ozarks community begging for the usual ugly stereotypes: ignorant hick Trump voters addicted to meth and guns. But McHugh never goes there, instead giving her readers a rich, visual, complex portrait of an America few Americans ever see. Kites opens in 2016 Haverford, Maine, as narrator Robert Carter contemplates a shuttered paper mill whose "giant wooden doors have been padlocked shut my entire life, but now they are open wide," awaiting a wrecking ball and a chain superstore. The open doors beckon Carter to recall the singular event that happened behind them, closing out his childhood and altering the course of his adult life. Carter's childhood is the heart of the story, which picks up forty one years earlier, "on the first day of my eighth-grade year" at the hands of bully Hollis Calhoun. Every schoolboy's nightmare, Calhoun aggravates Carter's already potent stew of anxieties. Despite the life lessons brother Liam lives every day, Robert hasn't learned how to be free, to stop running, turn around, and like the boy Will Byers in Stranger Things, banish his demons. He won't learn how to be the man he becomes until he meets the magnetic Nathan Tilly, who shows Robert the magic of confidence when he banishes Hollis Calhoun. Lucy Dane must rid herself and her town of different monsters, as she searches for the truth that will set her free: the fate of her mother Lila, a bright, bewitching beauty everyone vividly remembers, who vanished shortly after Lucy's first birthday. Lucy opens Blood explaining how the apparently random, brutal death of childhood friend Cheri Stoddard reframes her attitude toward her mother's disappearance. Where its uncertainty once wrought despair, it now suggests optimism. "When Cheri turned up in the tree, I knew uncertainty...was a luxury, a gift. The worst part was knowing for sure that your loved one was dead, and I was grateful then that my mother's body had never been found. The mystery eats away at you, but it leaves a thin rind of hope." Rind in hand, Lucy assembles an entourage of the dispossessed: Gabby, Bess, Daniel, Birdie, Ransome Crowley, and Lucy's father, Carl Dane. With the rough, thicket-entangled Ozark hills as both lovely and lethal backdrop, a Garden of Eden after the Fall, they face the devil together. Like the kites his father made, cherished, and flew along the Maine coast, the truth that emerges from an old mill sets free Robert Carter. Lucy Dane's truth escapes a place just as forbidding, a cavern the locals call "Old Scratch, with narrow tunnels and false floors and an underground river that never saw light"
"Old Scratch, of course, is a nickname for the devil. I didn't go in," Dane recalls. But readers should go in, as two talented Columbia authors swing the doors wide, to resolve a dilemma we all struggle with at some point: the scary but exhilarating decision to be free.